Before you panic, I’m just being OA, sorry. I’ve just arrived from a meeting in Makati, and Teacher Clarice (our preschool head) drove my Mirage from Sta. Rosa. It was her first time to drive to Makati without her Dad’s supervision, so ipinagdasal kami nang matindi, hehe. I didn’t tell her but during the time na gitgitan sa EDSA kanina, my palms were sweaty. Diyos ko, bata pa po ang anak ko! To calm both of us, nagdaldalan na lang kami. One of the things we talked about was our favourite TV series. And one of my super-duper favourites is really The Wonder Years. One of the reasons why I love it so much is that it reminds me of a once upon a time in my life. Although it depicted the coming of age of a boy in the late 1960’s to early 1970’s in a suburbia in the US, it still unearths the long-forgotten pains, joys, insecurities, desires, and dilemmas of a preteen me in the quiet town of Kabacan, North Cotabato in the early 1990’s. I could very well be Winnie Cooper and my next-door neighbours Ivan and Balong could be Kevin Arnold and Paul Pfeiffer (sans any romantic angle. Childhood sweethearts—especially among children who grew up together in close proximity—happens only in teleseryes, IMHO. Read about the Westermarck Effect). But the going biking together part, the playing together, the teasing each other—they’re all true. The Wonder Years is a time machine that brings my mind even farther than just my preteen years. Back to the time when there was absolutely nothing to watch on TV on Good Friday, that I learned how to use kadang-kadang and became so good at it. Back to the time when we were explorers and we would “brave” going out to the damuhan 100 meters away from our house, where there was a hut whose resident we said was an aswang. Back to the time when being girly bored me. My kind of fun was playing “prisoners of war ” with Balong, Ivan, my brother and other boys from the neighborhood (I was the only girl!) ‘Pag nahuli ng kalaban, kikiskisan ng sili sa likod. I remember thinking that punishment was so silly. Little did I know that the “silly” sili punishment hurt like hell! Back to the time when my swimming pool was the pit that Dad dug to accommodate rainwater. After a night of heavy downpour, excited na ako! And although my parents would tell me not to wade through those waters because they were filthy, I would end up jumping up and down the flood waters and there was nothing my parents could do. Back to the time when Ivan and I ended up beating each other (and I smashed his head on the root of a their jackfruit tree 🙁 ), just because of a stupid argument: Ano’ng mas malaki, million o dollar (because of Million Dollar Movies)? 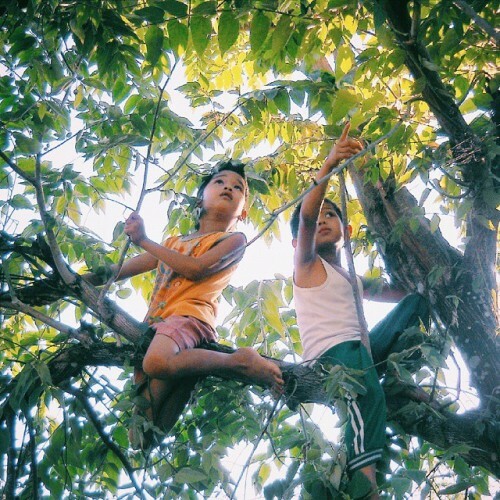 Back to the time when we would kick off our mornings during the summer climbing aratiles trees and risking my life going to really thin branches just to get one huge, red, ripe aratiles. Speaking of aratiles, I also remember jumping off the branch of a fallen aratiles. My whole left cheek was scraped, and I distinctly remember Mom’s expression upon seeing me: she was torn between blaming me, blaming herself, and being scared that my face would be scarred for life. The following day she enrolled me to a summer class. I could go on and on why my childhood in the province was anything than boring, despite having only one channel on TV (we only had cable TV when I was l was 11 years old! And we had to ikot-ikot our antenna pa palagi!). I would come home stinky, sweaty, dirty…and happy. Hay, how different it is for Raviv now. We don’t know our neighbors, and we couldn’t even let him play on the streets. Well, ang arte ko rin naman kasi. “Sunblock muna bago lumabas!”, “Aaay, pupunta sa damuhan—mosquito repeller muna!”, “Naku pawis na pawis na!! !” Mga ganyang pag-iinarte. But I know you can’t blame me—ganyan din kayo eh, hehe. As they say, iba na ang panahon ngayon. Which is just sad. We left home very early. After four hours’ drive, we arrived in Real and spent another hour on a motorboat going to a secluded beach in Infanta. At first we were amazed with the colourful small crabs that were popping out of the mud! Then Dodong taught us which holes had tulya inside them. And then I threw caution to the wind—I was a kid again not caring whether I get all muddy. I was burying my hand deep into the tulya hole, kneeling on the mud, getting muddy and sunburnt all over. Buwis-buhay, just like when I would reach an aratiles fruit precariously perched on a thin branch. It was such a great feeling! But of course, just like when I scraped my face when I jumped off the aratiles branch, the reliving of my childhood wouldn’t be complete if I don’t get an accident. For the first time, I was stung by a jellyfish. Waaaah! If the hours and hours I spent watching The Wonder Years brought my mind back to years ago, the five-hour trip to that secluded, signal-less beach in Infanta was the closest physical thing to my canal-swimming and aratiles-gathering days. What about you, what’s do you miss most about your childhood? This made me miss my inay (my mother’s mother or to make it easier, my grandmother 🙂 ). She would make minatamis na pinya candy from our kahoy na lutuan. I would fetch her water from our tapayan. I would eat dinner in our mahabang bangkong upuan. And there’s also itay (my grandfather). He would let me ride his horse but in the company of many niyog or buko (nasa loob ako ng malaking basket na nakaangkas sa kabayo). He would make me flying leaves. Those were real super fun memories with my grandparents. Sumalangit nawa ang kanilang kaluluwa. I also call my maternal grandmother “Inay”, although I called my maternal grandfather “Tatay” (he’s gone, RIP). Tatay used to buy me balut and used to walk me to the park. Sigh.